In today’s airtight homes, indoor air quality is a rapidly growing concern. Most indoor air contains dust mites, mold, mildew, pollen, and animal dander. Many of these contaminants are circulated through the air vent system and can aggravate asthma and allergies. Rapid Recovery Service utilizes state of the art equipment including the patented Rotobrush® Air Duct Cleaning System and the Roto-Vision® Video Inspection System. This revolutionary cleaner enters your air ducts and provides complete cleaning at a faster rate due to its added suction. 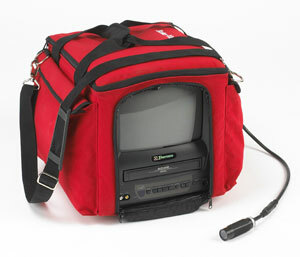 Its small design allows entry in crawl spaces and attics. 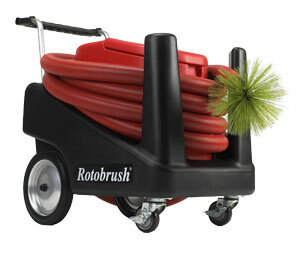 The various-sized brushes attach to the duct robot and scrub all dust, dirt, and allergens from your ductwork. 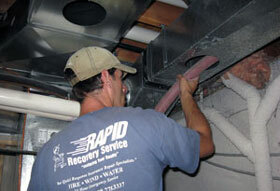 Rapid Recovery also has a fog deodorizer that sprays into the air ducts to supply your home with a clean scent. Cleaning your air ducts will benefit from cleaner air, especially if you or a family member has severe allergies, asthma or other health conditions related to allergens and dust mites. If your home has any type of water damage in the roof or attic, then water and mold may have entered your ductwork. Thorough cleaning can help eliminate harmful odors from your air-conditioning system. The Roto-Vision® system lets you see deep inside air duct systems during cleaning. With this system, Rapid Recovery Service can show you the cleaning in action and the final results.